$12 Automotive Scan Tool for Android™ with all vehicles plus extra manufacturer support. No Adds, No Additional Charges, No Internet. Read and record data, read and clear trouble codes, view and perform tests. Real Time Plots, Gauges, Statistics, Elapsed Times, Sound, Alarms, Fuel Economy, Accelerations. With ELM 327 OBDII Adapter, 0ptional MindWave Brain headset. For first run, plug ELM-327 Adapter into vehicle OBD-2 connector located under dash. For Blue Tooth Pair with OBDII device listed in Android Settings, ID 1234. Select "manuf" For All GM VIN and extra identifications. Select "EXPO" to save data as tab separate spread sheet text file in Android download directory. DATA page will list all supported real-time data items. Select a item and press START. PLOT will plot selected item. "Auto" or "Man" scaling. X10 power scales. R4 ranges. 1s/d seconds per division time scales. Real-time "Sound' or "Alarm". Auto" or "Man" scaling. "Value" or "Rate" per Sec. Select and realtime display. "Avg" Total "1" or "10" second rolled interval. "Std Dev" or "Error", Total sample count. "Min" or "Max". "Prob" probability of Minimum or Maximum. "Limits" of Range. Scale Resolution. Sets Desired sample interval of selected item. Elasped Time lap Start Stop Set "Ch2" two channel Stop Watch. "Last", "Avg", "Min", or "Max"
Displays "OBD2", "form" Distance, and Fuel equations,"manf" manufactuer, "sens" acceleration, "EEG"
Displays total number of Current OBD-2 trouble codes from all emission servers. Select to Request. Select "obd2" or "manuf". If manuf. select a server "Engine.."
For GM apps, select "manuf" for additional freeze frame and fail records. 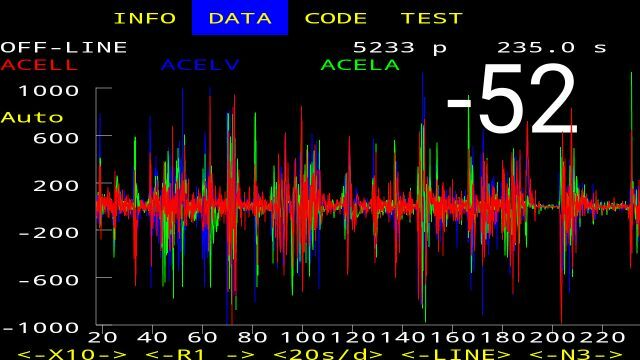 Expressed as number "Ratio" or "Percent"
Provides listing of testing results to determine a OBD-2 trouble code. Select "manuf." and a "Engine.." server for manufacturer Device Test and Control. ebay Blue Tooth $9 New Version. Each tested before Free ship. Supports Ford Van and trucks with 16 pin OBD-2 connector. Injector Buzz, Cylinder Contribution, Glow Plug and Output Tests. Injector Buzz, 2003 Cylinder Contribution, Glow Plug and Output Tests. Injector Buzz, Glow Plug and Output Tests. Injector timing, balance rates and pressures with control settings. 2004-2005 LLY Variable Turbo Controls. Brake real time data and bleed activation. Fail Record and Freeze Frame. Trouble code read and clear for 12 computers including airbag. Injector Time set, Cylinder Drop and Glow Plug control settings. Historical Codes, Fail Record and Freeze Frame. Real time Cam Shaft Offset, knock retard, misfire, torque, injector pulse. Crankshaft CASE learn, injector drop control. Transmission fluid temperature, shift times and errors. Fail Record and Freeze Frame. Brake real time data and bleed activations. Fail Record and Freeze Frame. Trouble code read and clear for 10 computers including airbag. Real time knock retard, misfire, torque, injector pulse, cam signals. Brake wheel speeds and bleed activation. Trouble code read and clear for 9 computers including airbag. Read up to 22 On-Board Computers. Transmission fluid temperature, pressure adaption, shift times and errors. Brake wheel speeds, and ABS valve and pump data. Read up to 15 On-Board Computers. Real Time Data and Device Control. Knock Retard, Injector Pulse, Misfires. Transmission Shift Times Fluid Temperature. No ABS data for S-10, Sonoma, Blazer, Jimmy. Power Train Engine and Transmission. Transmission Shift Times, Adaption Pressures, Fluid Temperature. App supports NueroSky Mindwave Mobile 2 Blue Tooth EEG Headset. 60 Hz real time brain voltage. Providing research, development, test, and certification software to automotive manufacturers since 1978. Manufacturer and developer of obd2 automotive network equipment, software and obd2 web services since 1995. Copyright © 1995-2019 Alex C. Peper dba Car Code. All Rights Reserved.